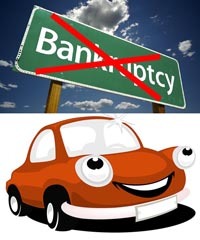 I don’t want to file bankruptcy on my car! I hear that often, and my response is always "You must list all of your assets and all of your debts". But then I proceed to explain that it's very likely that they can keep their car. Let's see how and why. In California you get to keep your car if all of the following are true. 1. Any equity you have in the car (current value less money owed on it) can be "exempted". We won't discuss exemptions here except to say that in California, most people who file bankruptcy can exempt their car. Discuss this with your bankruptcy attorney. Note that this is a requirement in a Chapter 7 bankruptcy, not in a Chapter 13. 2. You keep making the car loan payments. 3. You sign a "reaffirmation agreement" if requested by the lender. This is an agreement that says you'll be responsible for the full balance owed on your car loan (in spite of your bankruptcy) if later you can't make the payments. You definitely want to discuss this with your bankruptcy attorney. Note that there also may be ways to reduce your car payments in a bankruptcy, "redemption" in Chapter 7 and "cramdown" in a Chapter 13. Be sure to ask your bankruptcy attorney about the possibility of those for you.